This is an attempt at recreating Ricola Dual Action cough drops in vape form. If you haven’t had these cough drops, the sweet honey-lemon outer-shell tastily gives way to an intense mentholated, soothing herbal syrup center. I am obviously not using ten different herb concentrates here, but I don’t find all of them necessary to impart the flavor of the product here. A few of them listed in the ingredients list of the drops are probably there for their medicinal properties. Instead, I’m just going to include the ones responsible for pushing that signature Ricola herbal flavor. Props to u/CheebaSteeba for giving me a good start for my recipe with his Lemon Cough Drop mix. Eucalyptus is not an included ingredient in Ricola drops. However, it’s scent is still a dead ringer for them, and we know how well a fit this flavor is for vaping when you are under the weather. It’s cooling properties are also a plus, here. You can’t have lemon cough drops without the lemon, and this one fits the mold perfectly. The perfect honey flavor for this recipe. This is not generic supermarket honey that has had all of its beneficial florals removed. This is more akin to raw honey straight from a hive. This is a very strong flavor so we only want to use a bit of it, but it also needs a few days to mellow out. I actually prefer it without a steep. One of the ingredients in Ricola’s herbal blend. Imparts the anise flavor to the recipe. While not the best Elderflower flavor as far as authenticity goes, it works fine enough as a floral for its use in the mix. 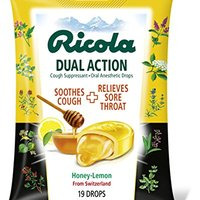 If you like these Ricola honey-lemon cough drops, give this a mix. I don't like this juice. But that's because wasn't until I tried it that I remembered that I don't like these cough drops. This is a super solid representation in vape form and it's soothing, too. I'm told the room note smells like "some old ladies I sat behind in church and I thought that must be what death smells like," but if you're into these cough drops possibly contagious, a room note that keeps people can be a feature rather than a bug.